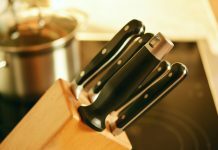 Do Kitchen Aid Knives Make the Cut? If you’re building a wedding registry, you might go to Macy’s or Target to start building your knife collection. 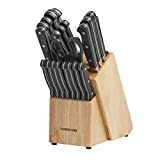 Across Amazon, a KitchenAid knife set receives over 4 out of 5 stars. With a love for design, these knives are guaranteed to look great on your counter-top. Founded in 1919, KitchenAid believes “food may feed to the body, but making feeds the soul.” As a household name for almost every kitchen product, they should at least be a contender in your search for the perfect knife set for your home. Why Choose the KitchenAid Knife Set? The stainless steel used in the KitchenAid knife set gives them a sharp edge that stays sharp for longer than other steels. The brand also considers this stainless steel to be dishwasher safe, and reviews agree that the knives will not rust after going through the dishwasher like other knives. Even if you prefer to handwash your knives, the option to use a dishwasher adds to the convenience of the product. The stainless steel knife sets include an Integrated #600 Diamond Grip Sharpener at a perfect 17-degree angle for sharpening. If you’re not sure exactly how to use the honing tool of the knife set, consider one of the sets with this tool included. Because it comes built-in to the block of the set, you can conveniently sharpen knives before or after use, keeping them at peak performance. Not every KitchenAid knife set includes the triple rivet feature, but this gives the knives an ergonomic grip that reinforces the handle and adds a simple decorative element. However, the rivets do not add too much to the cost of the knives when compared with the brushed stainless option so that you can make the decision based on personal preference. Because ceramic is not as porous as steel, the blade will not transfer flavors between foods as you cut. Of course, since these knives are not metallic, they will not rust and are completely dishwasher safe. The diamond-ground blade remains super sharp for longer. Instead of a triple rivet feature, these knives have a textured grip to keep your hand from slipping. 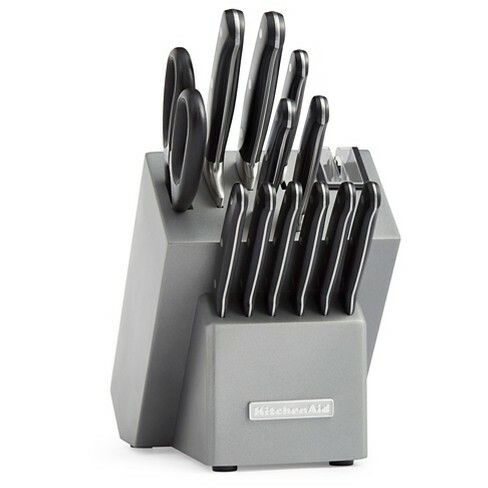 Across Amazon, a KitchenAid knife set earns over three stars from reviewers. They specifically mention the value for the price of the Classic Forged set between $60 and $90 for a 16-piece set and averages 4.1 out of 5 stars. 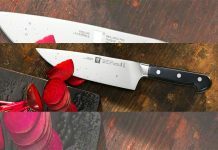 The more expensive Professional Series averages 4.3 out of 5 stars, and buyers noticed a better weight to the knives and a good grip on the handles. Because this set does not include steak knives, you might think you’re missing out. However, the comments on durability leave buyers with no regrets. 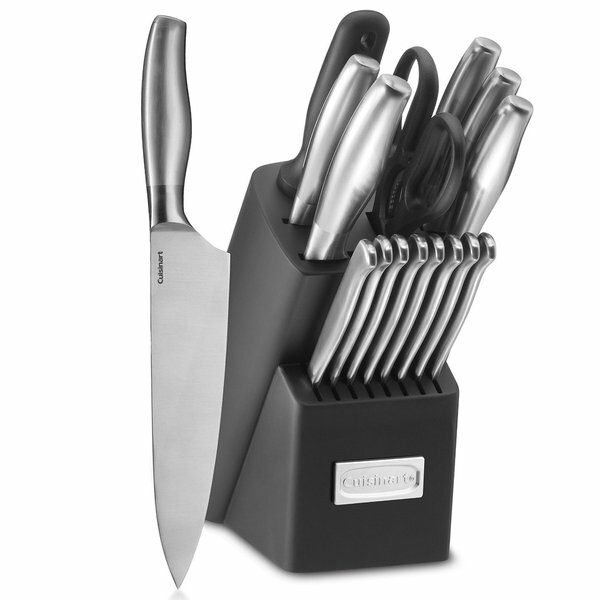 The Professional Series runs much higher, but the cost seems to cover the colored knife block more than the blades. Otherwise, the pricing lines up with other mid-range knife sets. 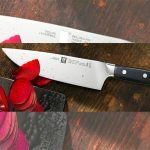 When we looked for the top KitchenAid knife set, we looked at every marketplace available -- from Amazon to Macy’s -- and read through hundreds of customer reviews and claims. We sorted through the descriptions of specific characteristics for each set and their competitors to understand how it holds up against the others so you can make the best decision. You don’t have time to read all the reviews (especially if you’re trying to build a wedding registry), so we did all that work for you. With several types of materials, the number of included knives, different blocks, and characteristics for each, where do you start to choose a KitchenAid knife set? The Classic Forged KitchenAid knife set features the German stainless steel and two different handle designs depending on your personal aesthetic. The storage block also complements the color of the handles. Overall, this collection received an average of 4.1 out of 5 stars on Amazon. In each set, you’ll receive at least one paring knife, a serrated bread knife, Santoku knife, chef knife, and a slicer knife along with a pair of scissors and serrated steak knives. 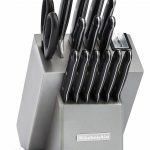 This black-handled with steel reinforcing rivets comes in a “silver sleek” knife block with a built-in sharpener for convenience and razor-sharp edge. Available in 14- and 16- piece sets, with six steak knives included in both packages. Many reviewers commented they liked the weight of the knives and the feel in their hands. They also felt the knife block looked great on their counter but were disappointed about the serrated steak knives. The brushed stainless KitchenAid knife set offer 12 or 14 pieces with blades and handles forged together for a seamless design and durability. Combined with the natural bamboo block, this set works well in a kitchen with a simple or rustic aesthetic without sacrificing quality. 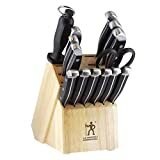 The 12-piece set includes 4 steak knives, with the 14-pieces has six. Reviewers did not have good comments about the steak knives again but found the other knives to be rust-resistant and a good value. 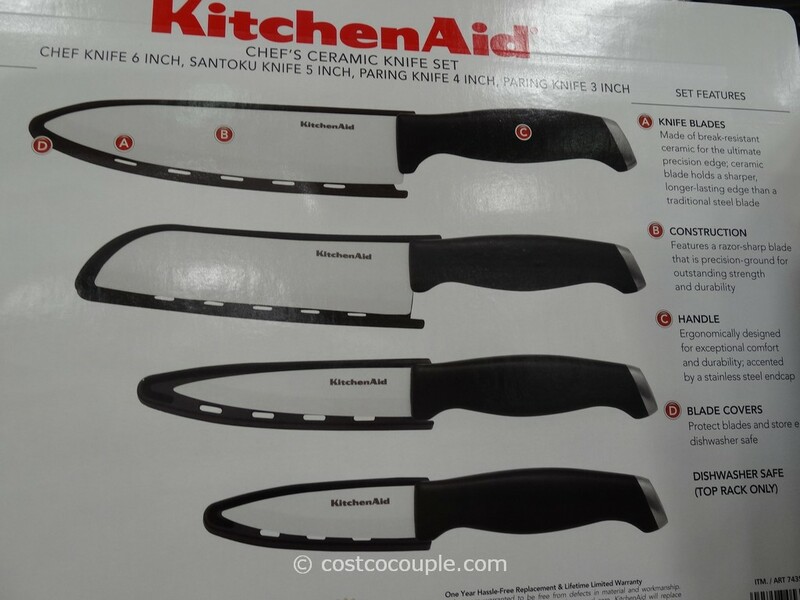 This is a less expensive option for a KitchenAid knife set. The price difference usually reflects the number of knives included. Despite the low cost, this series includes the most knives by rounding out the offering with several steak knives. 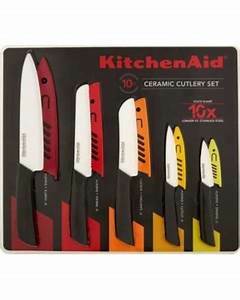 Ceramic knives are different from any other KitchenAid knife set because of their no-rust material. 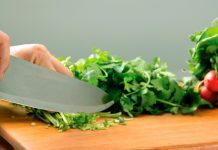 The material is also less porous than steel, which helps prevent flavor from transferring between foods while chopping. The other benefit for a ceramic blade is the easy cleanup in the dishwasher. These 3- or 4-piece sets do not come with a block for storage, but instead, provide custom sheaths for each style. 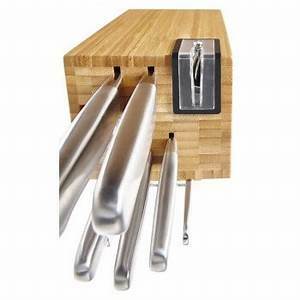 The three-piece set includes a chef’s knife, a serrated bread knife, and a paring knife. The four-piece adds a Santoku to the collection. While only four knives can seem fairly expensive, the consistently high reviews are worth considering. Buyers repeatedly commented on the sharpness of the blades, which should stay sharp significantly longer than stainless steel. 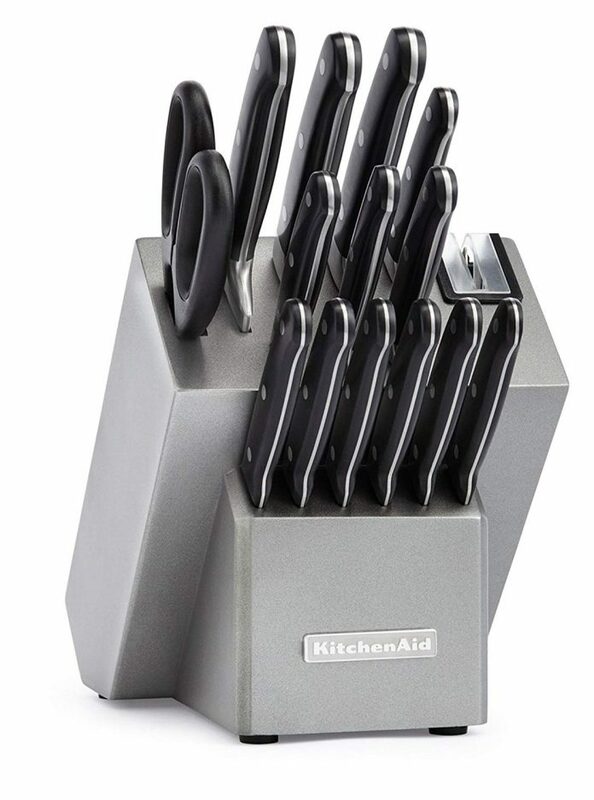 This KitchenAid knife set coordinates with another KitchenAid product -- their famous stand mixer. With custom colors, you can find the perfect match for your mixer. 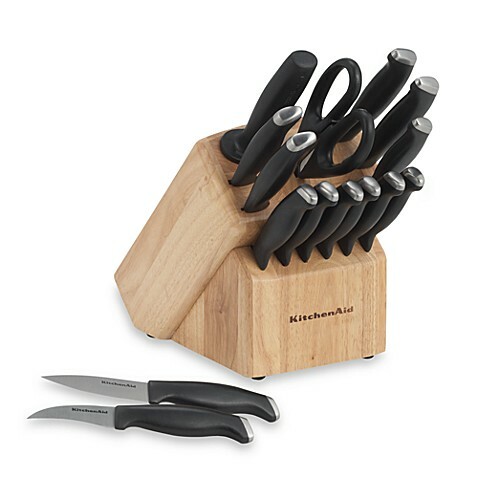 The 7-piece set includes a chef’s knife, bread knife, serrated utility, paring, sharpener, and shears. The 11-piece collection adds a slicer, Santoku, non-serrated utility, and peeler to the mix. The handles are non-porous fiberglass with triple rivet detail. The Professional Series steps up the German stainless steel with an ice-tempered blade which improves durability and keeps it sharp. 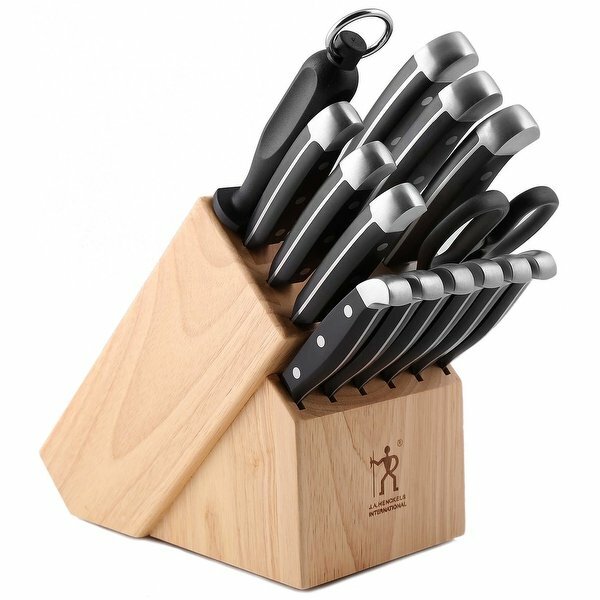 Both sets come with the same knife block, so the 7-piece will have room to grow if you purchase more knives in the future. This set is on the pricey end of the spectrum, depending on color and number of knives you choose. If you’ve only considered KitchenAid for their mixers, it's time to check out how their knives compare to their top competition. 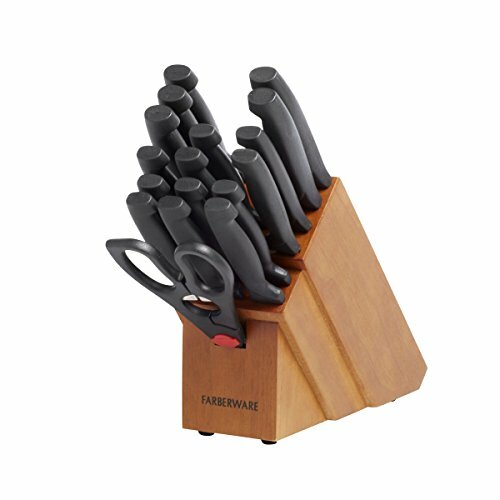 We’ll look at similar knife sets from Cuisinart, J.A.Henckels, and Farberware. Next, we'll give you the price range, knives included, materials, and warranty for each so you understand all the options. 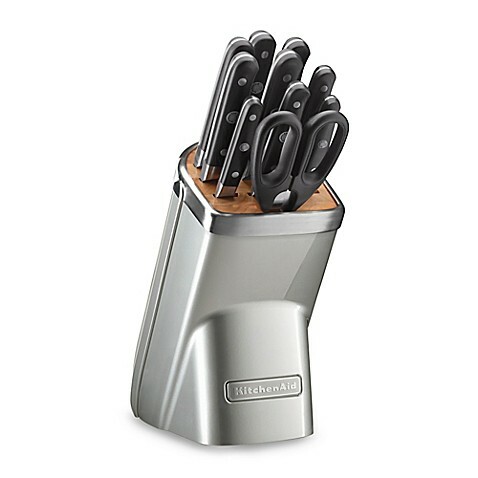 At a similar price point to the KitchenAid knife set, the Cuisinart Artiste Collection receives an average of 4.4 out of 5 stars. Many reviewers found these super sharp and strong. However, many people noticed rust forming quickly on their set despite handwashing, and several complained about the quality of the steak knives. Despite its important function in the set, more than one review shows the chef knife snapped while using. 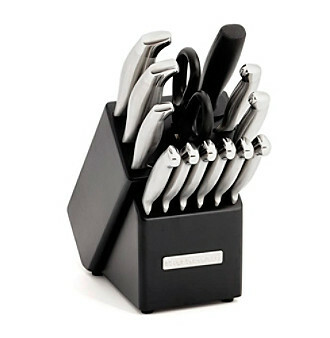 Most customers love the look of the set with its black knife block on their counter. Zwilling has been producing knives in Germany for over 200 years. Zwilling J.A. Henckels knives consist of German stainless steel manufactured in China. Their experience makes them slightly more expensive than the KitchenAid knife set, but the quality is high. A comparable set averages 4.3 out of 5 stars. ​Without the Zwilling component, these knives come down to a lower price, but some reviewers claim they lose the quality. While rust always comes up in reviews, most found that handwashing prevented the problem. However, buyers do not comment on the steak knives as often with this set, so if you’re looking for those to be included, consider the Henckel set. Significantly less expensive than the other sets, you’ll receive many different knives for your money. These cannot go through the dishwasher, but usually include some type of built-sharpener or a sharpening steel to round out the set. This set averages 3.6 out of 5 stars, with the main complaint being the shape of the handles. These are more square than ergonomically shaped, and users mention some discomfort. However, the number of knives included for the price makes it a favorite for some buyers. 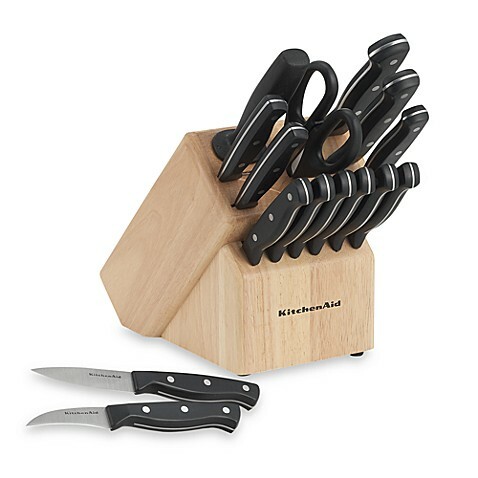 The KitchenAid knife set definitely holds up to the competition in value for the Classic Forged set. Even professional knives require regular sharpening with a sharpening steel, but these seem to hold their edge longer than most. With a reliable brand name like KitchenAid, you know these knives have been tested and reviewed by hundreds of customers. On the lower-end products, the KitchenAid knife set didn’t meet every buyer’s expectation. The Professional Series seems to be selling the colorful knife block, not necessarily the knives. Even though these are considered dishwasher safe -- and many customers had success with them in the dishwasher -- knives should be hand washed to increase the life. Reviews show fewer complaints about rusting on the KitchenAid knife set than on the other brands. The number of pieces in the set offers a complete package for your cooking needs. With the less expensive, but higher-piece set, many reviewers complained about the steak knives. They also mention the weight and handle of the knives. While you may think you get a better value with all those knives in a set, you might consider building your own set of quality knives you know you’ll use. 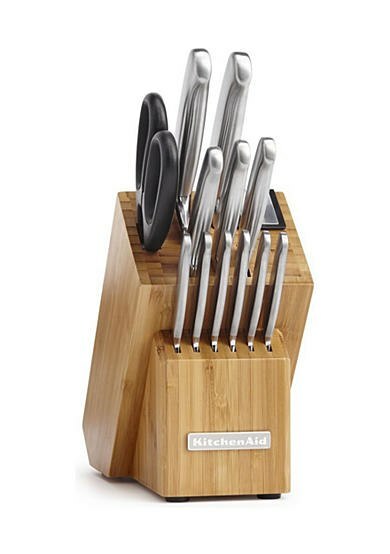 The KitchenAid knife set combines a popular home brand with a good quality product. As usual, you will get better quality if you pay for a more expensive brand. Many families find this set perfect for the look they want in a kitchen. With options for butcher block, black, and even colored knife blocks, your set can be a great addition to your counter-top. Despite dishwasher-safe claims, handwash your knives to keep them longer. With sharpeners included, you’ll be able to maintain this set for years to come.